Although there had been plans for a force of militia in Prussia for many years, and in the 18th century they had existed for a time, the Landwehr were only actually raised for the Napoleonic Wars in 1813, in the aftermath of Napoleon’s catastrophic defeat in Russia, and with a spirit of ridding Germany of the French occupiers. Prussia was hard-stretched to provide for her expanding regular forces, so there were many difficulties in raising, training and equipping the new Landwehr, but in time the supply situation improved, and the Landwehr began to demonstrate that they were an effective part of the Army. They participated in the last two years of the Wars, and were present in large numbers during the Waterloo campaign. 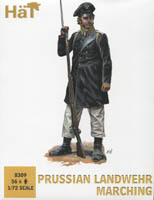 Following the pattern of other mini-series from HaT, this set is one of several released at roughly the same time to depict the subject, and this one concentrates on the men marching. There are only a handful of poses, and naturally all are marching. Four carry a musket in the proper way, and are perfectly fine. On our second row we have a musician carrying a horn, plus an individual carrying a pike of about 2.5 metres in length. In the early days of the Landwehr many men had no more than a pike such as this since muskets were in short supply, but by 1815 it is likely that only NCOs carried such things, as a mark of their rank, so this figure works for either. Both poses are very nice, as are they all. The Landwehr initially paraded in a wide assortment of clothing, some of it civilian, for want of anything more suitable being available. Again as time went on this improved, and by 1815 it is likely that most or all were in proper uniform. This was a litewka coat of varying length with two rows of buttons down the front and a standing collar, and that is what these figures are wearing. Most wore trousers over gaiters and shoes, which is again reflected on these figures, although one man has long gaiters reaching to the knee, which is perfectly plausible. The cap are basic with crown and peak, but here they are of different styles, again correctly reflecting the variety seen on the real thing. In short, all the costume is correct, and the variety is nice to see, although in 1813 there would probably have been far more variety than this, and a more scruffy look generally. The men have haversack, water bottle and cartridge pouch, but the designs vary here as they did in reality. Three of the four main poses have a separate pack and cartridge pouch, as seen on the lower row, which allows for some swapping about to increase the diversity as well as improve the look, so a great feature. They attach onto a peg on the back of the men, but will need gluing. The three such poses have the necessary straps, so can’t really have the packs left off. Four of the six have a sword as a sidearm, the other two do without, so once more good variety and a reasonable reflection of the likely actual state of affairs. Although the figures look quite good in our pictures, close up they have a rather woolly and indistinct look about them. There are very few creases in the clothing, giving them a quite unnatural smooth surface all over, and the faces too are quite basic, with deep-set eyes and almost no mouth. However if laid out en masse than the general impression is good as the proportions are OK. Apart from applying the back packs, the only assembly is the right arm of the hornist, which is separate but again fits fairly well, though still needs glue. Remarkably this is exactly the same piece as was included in the HaT set of Prussian Infantry Command, so has an incorrect cuff which is however easily corrected with trimming. The result is a much more natural pose, which is great, and the assembled figure looks good. The figures are also almost entirely without flash, and have no extra plastic, thanks to the simple but suitable poses. There is one glaring mistake, which is that the hornist has haversack and water bottle on the right hip, but only one strap over the shoulder to carry both. On the left hip he has just his sword, but there are two straps over the right shoulder to support this! It’s a clumsy mistake, but it only affects one pose luckily. While this set is limited in scope, those looking only to create a column or formation on the march will appreciate the lack of wasted figures, and will find most of what they need here. Small variety in clothing and kit adds to the good realism here, and the poses are simple but effective, with the hornist being a bit of a nice bonus. The sculpting may not be the most appealing ever done when looked at closely, but it does little to detract from a very creditable collection of figures, and while we are not fans of the quite soft, rubbery plastic used to make them, they are well worth having, and even work well with the marching figure in the old Airfix set.